Deck Guru’s team is 100% customer dedicated. We love what we do and strive to bring to every customer the ultimate experience in using a contractor. We treat every home as if it was our own giving it the detailed touch that it deserves. We go above and beyond to ensure our customers vision is brought to life by excellent planning, budgeting and best customer service. Our dedicated/trained technicians will deliver top notch workmanship to each and every project, regardless of size or value. Deck Guru’s Resurfacing System has turned old decks to like new condition for customers all over Washington. Our process will ensure your deck is safe and you can once again enjoy your outdoor space. With guaranteed High-Performance products Deck Guru will give you desired outdoor maintenance free deck you have been looking for. 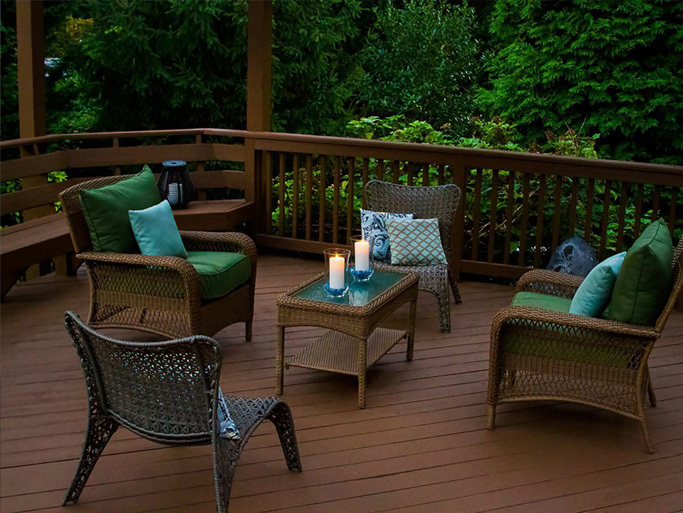 With variety of colors to choose from Deck Guru can match any setting. "LOVED WORKING WITH THESE GUYS"
We hired deck guru to redo our 15 year old deck.The outcome was more than satisfactory. to those who appreciate quality! TrexPro® Platinum is the highest level of recognition available for an independent contractor. TrexPro® Platinum deck builders are the leading TrexPros in their markets, with demonstrated ability and expertise to design and build outdoor living projects with Trex, ranging from the simple to the most complex. Do not replace your deck - resurface it with Deck Guru!